We're finally starting to bring our new building to life. This week we've been picking paint colors, which starts the grand process of designing our new theater. We believe that cinema will survive in the digital age--but only if we make the cinema itself a magical place to go to. Here's a sneak peek inside our new building, before we turn it into a two-screen movie theater, as well as a look-book of design concepts. The new Indywood is going to be a two-screen cinema! A century ago, the cinema was just being invented. In the dawning days of the 21st century, we're re-inventing cinema, but we hope to do so with homage to the past. Nothing connotes classic cinema like Art Deco. But we're certainly going to add our own flair. Let's call it "Bent Deco." The walls of our new building have some crazy angles. 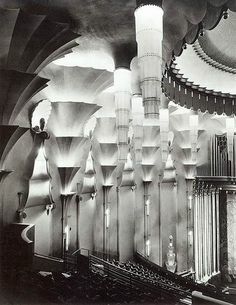 Always striving to draw inspiration from classic cinema, we hope to echo the stark but dreamy design of the great German Expressionist films of the 1930s--particularly The Cabinet of Dr. Caligari and Metropolis. Adding a little color, but sticking with the crazy angles, we're considering painting the floors with Kandinsky-inspired designs. We plan for our wacky walls to be accented by metal and wood, connoting the solid, trustworthy feeling of classic filmmaking equipment. The first movie cameras were made by Thomas Edison, so of course we need to light our new theater with the warm glow of Edison bulbs. 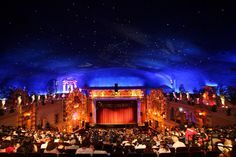 Another crazy idea: We love the starlight ceiling of the Sanger Theater on Canal Street. We plan for Theater 1 to have a "moonlight" theme with a Sanger-inspired ceiling. Crazy, colorful angles and solid metal trustiness--we hope that coming to the new Indywood feels something like driving in a classic, American muscle car.